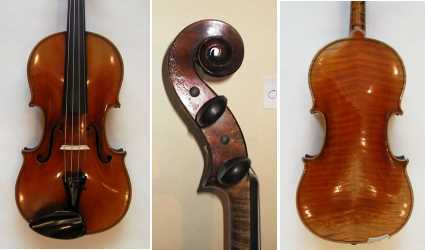 An excellent French by Jean Baptiste Allo violin in perfect condition just as if it had left the makers hands. Labeled Jean Baptiste Allo, Orleans. Fitted with new pegs, new top nut, new French Aubert bridge, new soundpost, Pirastro Eudoxa strings, Ebony tailpiece and new chin rest.